Each column on this cutting board resulted from a slightly different recipe for homemade Ritz crackers (and the board doesn’t show all of my trials). Some homemade Ritz cracker attempts used only butter, some used only vegetable oil, and some used a combination. Some were brushed with melted butter before baking, some after baking, and some partially through baking. Some homemade Ritz crackers had salt sprinkled on top and some had salt mixed into the butter (some used kosher salt and some used regular table salt). There were varieties with more baking powder and some with less. You get the idea. I came pretty close to getting the Ritz cracker right. The real Ritz cracker is slightly more fluffy, but the taste of mine is spot on (though most tasters thought that it was slightly better). Now you can enjoy Ritz crackers without high fructose corn syrup and partially hydrogenated oils. I say “you” because I don’t want to see another Ritz cracker ever again – too much taste testing!! While this homemade Ritz cracker recipe is a Cupcake Project original, I used Jeffrey’s recipe from What’s 4 Dinner Solutions as a starting point. Huge thanks go out to him. This recipe is made in a food processor. If you cut the recipe in half, you can fit it in a mini food processor . Homemade Ritz Crackers without the high fructose corn syrup and partially hydrogenated oils. Put the flour, baking powder, sugar, and 1/2 tsp of salt in the food processor. Add cold butter a few small pats at a time, and pulse to combine. Roll dough out as thin as you can. Mine ended up being all different thicknesses. Don't sweat it. They are homemade! If you are really concerned, Jeffrey had luck using a pasta maker to make the dough all one thickness - great idea! Use cookie cutters to cut the dough out. You can make them Ritz-shaped or any shape that you like. Poke holes in the dough in the Ritz pattern or any pattern you like (smiley faces would be fun!). Keep in mind that the holes are not just decorative; they help the crackers to bake correctly - so be sure to poke some. Bake the crackers on a parchment- or Silpat-lined baking sheet for ten minutes or until the crackers just begin to brown. As soon as you remove the crackers from the oven, brush them with the salty butter. I used these Ritz crackers to make a Ritz crust for cheesecake cupcakes. Wow, I could never do all of that testing…way to go! Oh my word…Ritz crackers are some of my store-bought indulgences. Not anymore, thanks to your thorough experimentation. Yay! I did enjoyed these very much. The texture isn’t like a real ritz cracker but still crunchy. They tasted more like a country homemade biscuit rather than that sweet buttery flavor ritz crackers have. They remind me of a crunchy biscuit rather than a cracker but they are good and tasted delicious with my goat cheese and dill spread. I just love how healthy you made these. It makes me so happy when old “bad” favourites are made into something great! Love it! Wow! Love the health factor! These looks great! You’re my hero-ine! These were my favorite biscuits as a child! But they got banned due to the partially hydrogenated fat. I’m so glad there’s a healthier recipe. I omitted the salt altogether, then brushed with salted butter & dusted with powdered sugar. They make wonderful cookies. Then I used the remaining dough to form tarts & filled with cream cheese and mini choco chips. Soooo good. They do, of course, make excellent crackers. i made full batch and they were so good they are almost gone!! Anon – I wish I could tell you. I did so many batches and kept playing with the batter so much that I never got a good count of how many were in a single recipe. :( If you make them, please tell me so I can tell others. I will be making these in the very near future. Trying my best to reduce using plastics… I nearly jumped out of my chair with excitement when saw you posted this recipe :) Thank you thank you thank you!! I am so excited to make these!! Now I am hoping to find a recipe for Homemade Triscuits! My collection would be complete. Hey! Thanks for the shoutout! I was mentioning to Mrs J just today that we were due to make a batch of crackers. I’ll use your recipe and hope to do as well. Yay! So cool, thank you so much for sharing, I can’t wait to try these!! Ritz crackers are my almost 2 year olds favorite “Cookies” and now we can make them together! Thanks for this recipe. You can roll things out a uniform thickness if you buy a dowel the thickness you need, break it in two and put them on either side of your dough. The rolling pin will roll down to the dowel(ie. 1/8 in.) and all your dough will be that thickness. This sounds like a great recipe. Thank you for your testing! I just made these and they came out great! Thanks so much! What was the vegetable oil you used? Anon – I used canola oil. I hope you used organic canola…almost 100% canola is GMO! Canola oil of any kind is bad!!! Olive oil would be a better choice. My husband loves those, I will def. try to surprise him with this homemade version! I feel confident in trying these knowing that you tried so many versions, thank you so much!! Using a chopstick end is quick and works perfectly! Dea – I used the end of a candy thermometer. A toothpick would work fine, just be sure to swirl it around a bit so the hole is a bit larger than just a little dot. Thank you so much for your quick and detailed reply, Stef!! I’ll be making these very soon, I just went to the store today and bought the cutter! :D Can’t wait! OMG I made them and they came out excellent!! My husband’s expression when he saw them and tasted them was priceless!! I made half the recipe and ended up with 54 crackers. I realize this is an old post, but do you remember what kind of whole wheat flour you used, white whole wheat, whole wheat pastry flour or regular whole wheat flour? I was hoping to make these with half AP/ half wheat flour as well. The pasta machine is a terrific tool for guaranteeing uniform thickness. I use mine for pierogi dough and for the dough for my chrustyky (Polish bow-tie cookies). Perfect every time… I can’t wait to try this recipe. This is AWESOME! I put the Ritz crackers back on the shelf during my last shopping trip due to the hydrogenated oils. My little boy loves them, so I’ll have to give these a try! These just came out of the oven. I love that I can whip them up quickly. I had to make some modifications to make them dairy free but they are tasty and my teething toddler can actually gum at them and I don’t have to worry about him choking on the pieces he bites off. Thank you, would you mind terribly if I post the altered recipe on my blog and link it back to you for the credit? Delicious! It’s almost too bad they taste so good – you want to gobble them up! :) I used olive oil and just put them straight on the cookie sheets (w/o paper) & they came out great! I started cutting them with my bunny & duck (Easter) cutters, but then decided that cutting the rest into squares was just about as nice and way quicker! So glad to find this recipe, as we’ve banned all goods with HFCS & partially hydrogenated oils too. Next time I might try using coconut oil instead of the butter or olive oil…. Best of all is you can crumble the broken ones and use it as a cracker coating for fish! My family also needs to be wheat free but we can handle spelt–the spelt crackers recipes out there leave a lot to be desired. This recipe is perfect. I can’t wait to try it tomorrow!! My teens and I miss “real” crackers! Thank you for a simple wonderful recipe. Just tried these and they seem to be a hit (I can’t eat wheat right now, so haven’t gotten to try them, but kids’ loved making them and eating them.) We did pumpkin shaped ones with faces poked into them. Just made these… SUCCESS!!! I am a caterer and have been looking for a Ritz-type recipe. I have a salmon spread I make as an appetizer that simply taste better on a Ritz. But I Ritz is not bite-sized. This will be perfect! I rolled them out right on to the parchment then just used my pizza cutter to cut squares the size I needed. I then went crazy with a fork to make the holes and baked. The first batch I did exactly 10 minutes and while they were good, they were too soft – cookie-ish. So I left the next batch in for 12 minutes. This was exactly as needed for my purposes. And the taste is spot on! Thank you! I tied making these, liked the pastry like texture alot, but for flavour, I didn’t like it. For me there was to much baking powder which left quite a bitter flavour. I’ll try again with less baking powder. When I cooked them I found 2 minutes to be to long and they just about burnt. 8 minutes was just right for my oven. I’ll give it one more try and see what we come up with. I love making homemade crackers! Use aluminum free baking powder! I also made the and endup throwing them away. They test too much of baking soda. I will try one more time with less baking soda. I guess 3 tspn is too much. When it tested like soda, I thought I must used the wrong measure spoon. The recipe calls for baking powder, not baking soda.. Baking soda would definitely change the flavor for the worse. I’ve made that mistake more than once! :/ bleck. only thing i changed was the oil i used olive oil baking soda was fine once you have the salt/butter on it was just a buttery crisp was delicious! Do you think it makes a difference if you poke holes in the cracker all the way thru to the cookie sheet or if you just press holes in them, not piercing the dough completely? You only need to perforate just below the surface of the dough. Tried the recipe tonight and LOVED IT! Will post soon on my blog as well. Tried these in a blender as I do not have a food processor, so they were a bit tougher I thought. Will get a food processor and try again! My family loved them though just the way they were! Some people are having trouble with wheat more and more. I found out for myself, it is the bromine put in many flours. I try to stay away from them now! I don’t have a food processor either. I cut the butter into small cubes, added them to the flour and worked it in with my finger tips until flour was mealy. I drizzled the oil in slowly with one hand while gently stirring the mealy flour with the other hand. I continued gently stirring the mealy dough with both hands working in any clumps (there were few and they were small.) Then I slowly added the water working it in with a fork. It doesn’t take very long to do this. It probably takes more time to get out, clean, and put away a food processor and they turned out perfectly. Man oh man these look amazing! I tried to convert it to GF using Bobs all purpose flour and they definitely did not turn out as beautiful. If anyone figure out how to o it PLEASE let me know, I miss buttery crackers like crazy. These were so good. I wonder if a coupleof super thin layers would mimic the puffiness of Ritz. For those with little extra income. Thank you for duplicating these crackers. They were an occasional childhood treat that was stopped when they were manufactured with bad quality fat and sweetener; it also changed the taste. Looking forward to eating “Ritz” again. Nope, they are not like Ritz crackers at all. Very mild taste and salt was no where to be found. Well, ‘Anonymous’, you are very unpleasant. No wonder you would not give your name. Stef cared enough to take the time and trouble to put a gorgeous recipe out there for all of us like that and you have to say something sarcastic and complacent? How rude. These turned out perfectly! They were a huge hit with my kids for an after school snack. I don’t have a food processor so I just used my hands to work in the butter and oil. For fun I used a variety of cookie cutter shapes. Great recipe! I just used my fingers to work in the butter. Add the butter to the flour in small cubes and just use your fingers to make the flour mealy. Drizzle in the oil in a small stream with one hand while stirring with the other hand and then gently stir with bare hands working in any clumps. (They will be small). Work the water in with a fork. It doesn’t take that long. It probably takes less time to do that then to get out, clean, and put away a food processor. I made mine this way and they turned out perfectly. palm oil is actually very good for you and Coconut oil is one of the very best oils for you, just avoid the hydrogenated versions. My doctor who has gotten diabetics off of meds & insulin told me this. Plus I have done a lot of research. I controll my diabetes with diet only (brought it down to around 125 from 215). The natural fats are the bests ones to use. We have been lied to about fats. The mainstream medical establishments blindly believe what they have been told & pass it on without doing research. The polyunsaturated fats are causing a lot of health problems. Do some research. foodrenegade.com is a good place to start. I’ve seen sites run by other doctors that say the same thing. Wow! Thank you, on behalf of my family, for your patience and determination. Tomorrow I will try them, for sure! I really enjoyed your post and your blog. I have a question on these… What is the texture like of the dough before you roll it out to cut it? Mine was very soupy, so I wasn’t sure if it should be up to 2/3c. water or if you actually use a full 2/3 cup? I ran into the same issue when I made them yesterday, after adding just 1/3 cup of water, I noticed the dough was extremely sticky. So I added a bit more flour and dumped the remaining 1/3 cup of water down the drain. Makes me believe this is just an error in the original recipe. Came out fantastic with 1/3 cup of water instead of 2/3. Also used a pasta roller for uniformity and a kitchenaid mixer instead of a food processor. The recipe looks great, and the pictures are so vivid, but it’s your blog that has blown me away…. How did you get the top to look like that? Please share, I’m open to anything. Thank you SO MUCH for posting such a wonderful recipe!! My kids love them and so do I :) Quick question for anyone who has made lots of these- what do you find to be the best way to store them to keep them crisp? Rubbermaid? Plastic baggies? Empty cereal bags? Thanks! I tried this recipe with several different flours and they came out ok but nothing at all like Ritz Crackers….and mind you I’ve been eating Ritz for over 50 years…..maybe that’s the problem…..can’t fool my tastebuds. Think I’ll stick to the real thing. Thank you very much for this recipe! I have a nephew who’s allergic to soy and nuts. Try finding a store-bought Ritz that doesn’t have soy or isn’t made in a facility with nuts! I live in a rural area, so no specialty stores. These crackers fit the bill and allowed me to make a family favorite recipe that he could have, too. No worries about those nasty allergens! We subbed canola oil for vegetable oil, and they turned out fine. I liked these better the second day. Thank you, again, for these fine crackers! Hi and thanks for this recipe! I know this is kind of old but if you get this message. . . I was wondering if the salt in the dough is important or if it is just for taste. I’m trying to make low-salt versions for my cracker loving toddler and would like to reduce the salt but I’m worried that it is important for proper rising etc. Do you think 1/4 tsp would be ok? I’m so excited to make ritz without that nasty cottonseed oil!!! THinking about using the palm oil shortening I have instead of butter but I know that is iffy because of the water content of butter. Lowering salt in the diet is not healthy. Eating salt temporarily raises blood pressure, but eating a low salt diet actually increased the risk of heart attack in more than one study. In fact, in one study, the increase in heart attacks increased to such a degree they aborted the test for the subjects safety! Please don’t put toddlers on low salt diets! See 180degeeehealth.com for more info and sources. I made these tonight to have with sausage and lentil soup for supper. I used a teacup to cut them out as I wanted bigger than ritz crackers. When I took the dough out of the food processor I thought maybe I should have held back some of the water-but it was super easy to roll out. I got 30 crackers out of this recipe. I had only 10 left to put away. They turned out wonderfully. Thank you for all your testing. my wife just made them, here are some of our LAZY changes. I agree–I liked the medium thick ones better than the thinnest ones. I also rolled them out on a pizza stone and used a pizza cutter to cut into rectangles. They separated as they baked and were very easy to remove from my stone. I used palm shortening instead of butter to make them dairy-free. And no butter baste and the end and they taste great! 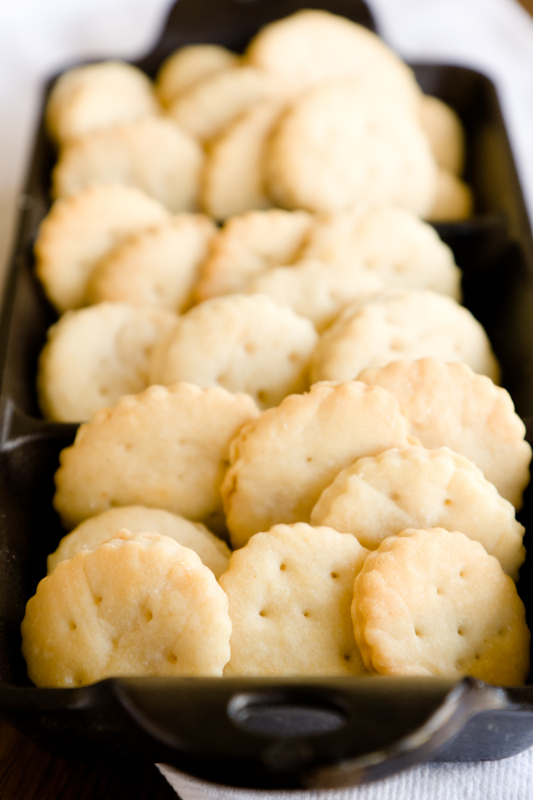 Not identical to Ritz, but they are definitely the best homemade cracker I’ve ever made. I’d say they’re like a cross between Captain’s wafers and Ritz. I’ll be making these again–thanks! Oh, I also did a half batch and it worked great in my little Chefmate food chopper. Thanks for the suggestion–I don’t have a full-sized one! Thank you for this delicious Homemade Ritz Cracker recipe. I have made them several times using homemade oat flour in my food processor. I still use about 1/2-3/4 cup of regular flour to 1-1/2 cups of oat flour since the oats don’t seem to absorb the wet ingredients as well. I use Extra virgin olive oil and also substituted 2 teaspoons of cream of tartar and 1 teaspoon of baking soda instead of the 3 tsp of baking powder to eliminate the aluminum. Oh and I also substituted Stevia “cup for cup” for the sugar. I add enough flour when kneading the dough so that the dough doesn’t stick to the surfaces of the rolling pin or the stainless sheet I roll them out on. I use a pizza cutter to cut them in squares and with a pie slicer/server and some flour I pick up the pieces to transfer to the pans. I don’t poke them either. They turn out light and fluffy when cooked to a golden brown, about 10 minutes on either a baking sheet or a wire rack. And since my oven is a tad hot I set it at 390 degrees. I then dip the crackers in butter flipping them over with tongs to coat the other side then set them on a cooking sheet to cool. They seem to absorb the butter uniformly too. I don’t add any more salt as they taste good just with the coating of butter. This last batch I used unsalted butter for the coating and still love them just as much. My wife does too! Thanks again. Very healthy crackers. Now to try them with some cream cheese, Neufchâtel sounds delicious too! I need to learn to make that homemade next. can you make it in a blender…i don’t have a food processor. Delicious! I think next time I’ll ratchet up the flavor by adding shredded cheese. Mmmm. I have done that! Try cheddar with a dash of cayenne and a few drops of worchestershire sauce and you’ll have the perfect chez-it cracker. Yum! Thank you for sharing the recipe. <3 I made those, and posted it on my blog. I did some small changes on the recipe, but I linked your blog in the post. Mine didn´t become as pretty as yours, but they tasted delicious! I’m glad you enjoyed! And – I checked yours out. They look cute! Hubby and I just made these and they’re awesome! Tastes great and super easy. Thanks for sharing this recipe! How long can they keep. How to store them? The BUTTER can be ROOM TEMP when mixed in with the flour! All the needless stressing over mixing in and using a food processor is unnecessary. I used ROOM TEMP butter and it was so easy and the finished product was perfect. Forget having to have the butter cold and stressing over machines and “working it in”. I am wondering if anyone has tried a Gluten free variation of this recipe? Has it turned out? I just did a batch right now. I added 1/4 tsp Gum-Tex to 1 cup of GF flour and then followed as directed. I just increased the salt in the very last step. 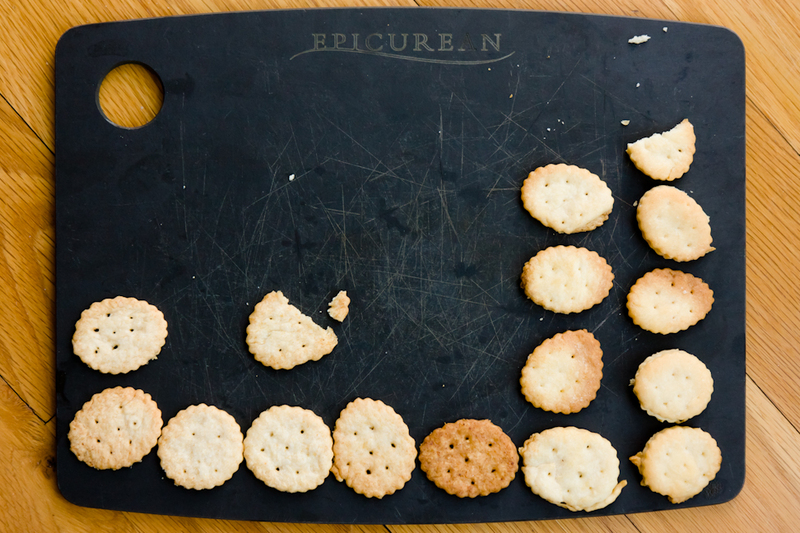 Taste is really close to the real thing, and the thicker-cut crackers had the closest texture. It is a bit crumbly (I’ve never baked GF before, so maybe this is my inexperience), so I just took small lumps and pressed them flat on the parchment paper (instead of rolling out a large sheet) and then cut circles. Used my flattest spatula to position them. Bake time was a little longer, too. These are great! I used coconut oil instead of vegetable oil (almost always do, I just make sure it’s in liquid form first) and a little extra salt in the crackers as well as a little extra salt and melted butter for the top. They came out very good! I made some very very thin and some just a little thicker and I think we like the thicker ones better! They stayed just a bit softer in the middle but still very crunchy on the outside. Yum! I will definitely be making these again, and probably try with wheat flour next time. I also used my stand mixer instead of a food processor (with paddle attachment) and it worked great. I made these tonight super yummy. I have fall cookie cutters and they are bite size. The kids loved them crackers with chicken salad. I am interested in giving this recipe a try. Any idea how long they will stay fresh? These are wonderful. I split the water 50/50 with buttermilk and rolled between two silpat matts for thickness. They came out flakey and way better than Ritz. Thank you. This is a fantastic recipe and what’s even better is that it worked so well with einkorn flour. The crackers came out fantastic, even better than the Ritz crackers I grew up with. My mother even liked them and she said, that as a child she hated Ritz crackers. 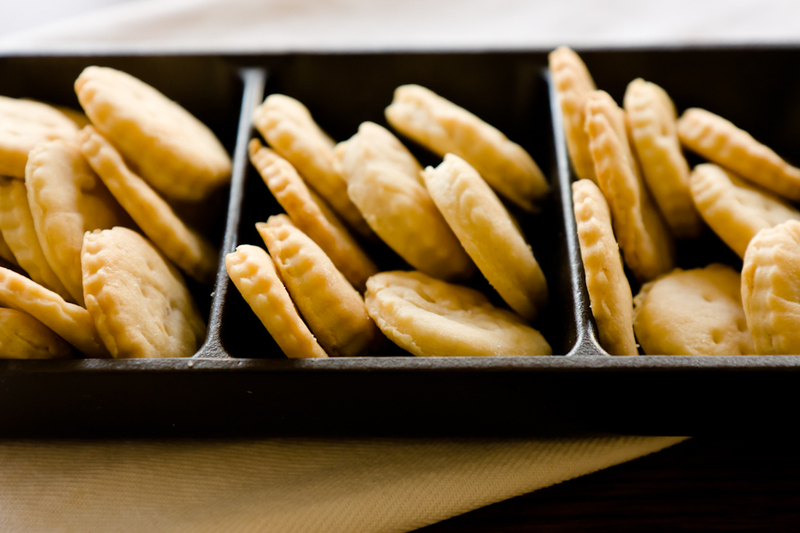 Love the crackers – a tip for making them as “fluffy” as Ritz™ – use ice-cold liquid and let the dough rest and refrigerate for 1 -2 hours before rolling out, then release the dough from your work surface after rolling, rest 5 min and then cut out – this way the dough will shrink way less. Chill before baking too…both you and the dough. Amazing, I’m some glad you called this a homemade ritz cracker. I would never have found this had it been named anything else. I used shortening in replacement for unsalted butter and subbed olive oil for vegetable oil. Yikes I know, but let me tell ya, it tasted better than ritz and the texture was more like cream crackers, in my case. Mmmmm…. made about fifty, well let me tell ya about half of them were gone in the first day! I don’t recommend using a blender I tried that first and had a burning smell coming out of it. To finish mixing the mixture I kneaded like bread dough. Next time I will use a mixer with a spiral dough hook. This recipe was awesome, I will be making another batch sooner rather than later! So thanks for sharing this one, as I’ve noticed many others feel the same. My married son asked if it was possible to make Ritz crackers. He wanted something healthier for his family. I lfound this recipe and made it with 100% red whole wheat. I used extra virgin olive oil for the vegetable oil and rolled directly onto a rectangular baking stone, using a piece of parchment paper on top. I used a pizza cutter to score into squares and pricked with a fork. The measurements given in the recipe were perfect, even with the 100% whole wheat variation. By the way, I made half a recipe and mixed it in the Pampered Chef Manual Food Processor. It was so easy and in no time, we had delicious crackers. This recipe is a winner and we will make this again and again. I’m eager to try it with Einkorn flour, as was mentioned by someone else in this post. Thank you, Stef, for all the hard work that went into creating this wonderful recipe! I just tried this recipe. Next time, I will use salted butter or add the full tsp of salt. But the real trick is in rolling the dough out very thin. I will also use my mixer instead of the food processor because by the last roll out, the dough was getting tough. Still, they were very tasty! I’m enjoying them with peanut butter and grape jelly! Often, these apartments have a parking space or garage. spors venues, hking trails and other recreational opportunities. Just found this recipe and tried it, its great! Biscuits are so light and tasty :) thank you! Cute pictures. If you have a thing for crackers, you really ought to check out Crackers and Dips (Chronicle 2014), it’s full of cracker recipes and spreads! You also might try adding barley malt syrup to your own unique recipe, it really adds a lot of buttery, toasty flavor. Where was I…right…so I’m looking all over the internet and Pinterest for genuinely home made Kit Kat recipes that might allow for the most to be made from scratch. I found the perfect homemade butterscotch recipe, graham cracker recipe and finally, crispy buttery crackers…those were the hardest to find! I can already tell that they are exactly what I was looking for! A million thanks! Curious how long they keep? I’m assuming they usually disappear well before that time approaches, but just curious. :) Also, has anyone tried to freeze the dough? I like to pre-make a lot of things (like pizza dough, cookie dough, etc.) and usually do it all in a day with my kiddos. Thanks! Looking forward to trying this! I wouldn’t keep them longer than a few days. They won’t be as crisp. Hi, I made these a couple of weeks ago, while searching for a few good recipes for a goodie basket. Well, let me tell you, this one makes the cut! I noticed that the crackers did absorb some of the humidity in our Oregon rainy fall air, so I put them back into the oven at 210 degrees for between 30 minutes and an hour. Perfect! This recipe is a STAPLE at my house. I make a batch every Sunday for my kids snacks throughout the week! THANK YOU! Thank you for your recipe!! I’ve been craving crackers for about a year. I refuse to eat anything like that from a store. I used sprouted white wheat flour and a little einkorn flour and they were heavenly!! I had to add 1/4 cp more of the einkorn flour because I used all the water. Baking with einkorn you need to decrease the liquid by about 20%. I baked them for 12 mins. at the 400 degrees. Had some homemade turkey soup and put cream cheese on the crackers. Question….how to keep them crispy the next day? They still taste good but not crispy like a cracker from the store. I’d appreciate any info on this. I put all my ‘stale’ (wimpy) crackers in the toaster oven for just a quick heat up….and they’re crisp. I made these about a year ago, the food my food processor was too tiny lol! When i struggled, I threw it into my kitchenaid mixer and pounded the butter and flour together on high speed with a paddle attachment. It did the trick :) Tne crackers that had the biggest ritz taste were the ones that still had more coarse salt on them. I’m going to make these again, this recipe made enough crackers to fill a large canister. They were crisp and delectable as long as you let them cool to room temp! If you are new to baking, you have to let the crackers cool so they can harden and crisp up. 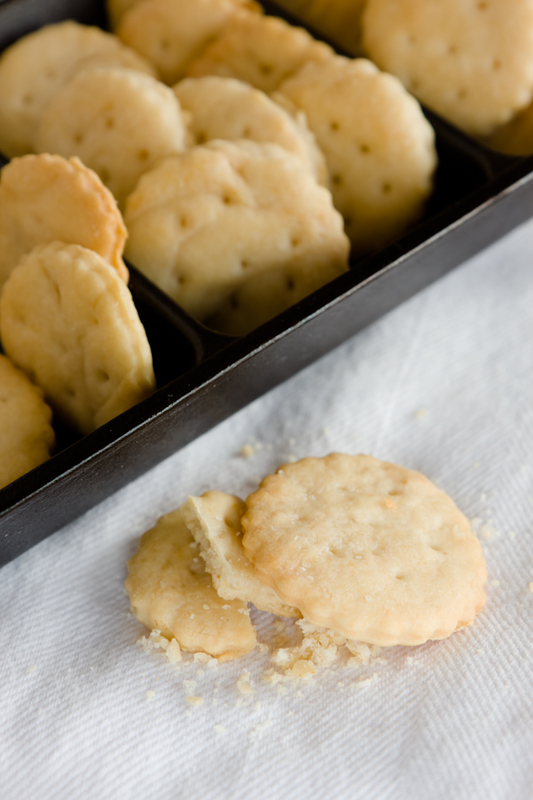 Putting warm crackers into a canister creates steam and soggy crackers, and mold! Hello. This looks like a good recipe but what I actually need is a recipe for a cracker crust. I’m wondering if I can skip the step of making the crackers and then crushing then with butter to make a crust. I’d like to just make a crust instead. Any ideas how I could do that? Thanks. Yay! Thanks for telling me! Just wondering the best way to store these? I made homemade gold fish crackers a while ago and the got soggy in the container. I’m hoping these work with a gluten all purpose flour. Thanks for this recipe! I had been trying to duplicate chicken n a biscuit crackers and this recipe is perfect. Add 1 tablespoon chicken stock powder (not bouillon, no salt) to the dough and also use to sprinkle before baking with a little onion powder and garlic powder. Yum! Last note – I roll the recipe out to cookie sheet size (two sheets) and place the rolled dough on the sheet and then just use a pizza cutter to cut into rectangles. They shrink enough in the oven to separate. Thanks again! I needed cracker crumbs for a recipe. I found this recipe and tried it though as first I was a little intimidated by it. I could not believe how simple this was to do. I sued ghee instead of the oil and they tasted just like Keebler, not Ritz at all. Didn’t matter tho because they ere still buttery and that is what i needed. One reviewer said they tasted like a biscuit. Some of mine tasted that too but I think that might have been because I didnt roll them thin enough. I rolled them so paper thin and that batch was perfect…the perfect Keebler cracker. I am thinking of running the dough through a pasta maker to get consistent thickness. Anybody tried that? I did not like them. They are noting compared to the ones you buy at the store. So I needed some crackers to go with my soup today for lunch and found your recipe. This recipe makes a very good cracker. I found that rolling them as thin as I could gave me a cracker about 1/16 of an inch. 10 minutes was too long and I reduced to 8 for the really thin ones. I found 1/8 inch to produce more of a cracker instead of chip. They didn’t stick to the baking sheet – no need for parchment unless you are rolling onto it and cutting them directly on it. I’m going to try this with White Lilly soft wheat flour and see if it’s a little flakier. Oh and I didn’t use the full 2/3c water probably about 1/2c. Made these turned out well very tasty indeed will be making another batch soon. They cost about $3 a box. You probably spent 10x that or more. Ridulous. Note to anyone looking to make this. I believe 2/3 cup of water is a mistake. Use 1/3 of a cup or you will end up with a soupy batter instead of a dough. I made this yesterday, and 2/3 cup of water to 2 cups of flour is WAY too much water to make a firm rollable dough. Thank you for this quick, easy and delicious recipe. I tried to follow the recipe exactly but had to sub 1c AP flour for 1c bread flour because I was out of AP flour; I’m not sure how significant this is though. Anyway, the taste of my crackers was more saltine cracker like. Next time I may try brushing the baked crackers with butter only to see if they taste more like a Ritz cracker. Also, I followed another commentators suggestion to use a pizza cutter to cut out the cracker shapes and that worked great and made the work so easy. I didn’t bother separating the crackers any more than the pizza cutter in which I was fine with the end product but if I wanted each piece to truly be crispy then I would separate them more. My final comment is more of a question. I may have missed it, but didn’t see any notation of the blade to use in the food processor (one of the best investments you’ll ever make is buying one of these beauties) so I used the dough (plastic) blade. Is this correct or does it even matter? Recipe looked good but that annoying music that keep playing with no apparent way to shut it up means I’m out of here before it drives me to murder someone! Oh no! I’m so sorry! I thought I had changed all of my videos to not autoplay. I guess I missed this one. I just fixed it. To make as crumbly as the real ritz, add more butter. 2.5 times as much to be specific. I put 1/4 cup each dry milk and potato starch in mine~ the outer ones (I rolled & pizza cut them for speed) were crisp and light. Interiors were not as crisp but soft~ perhaps if more time avail I’d separate them. 1/4 rolling pin worked well over wax paper. Thanks! I want to make these but I have to stay very low carb and no wheat products. What flour can I substitute in place of wheat flour? Great recipe, I cut the crackers out with a gingerbread man cutter and did a fork poke for the eyes and buttons. Our family and friends loved the recipe and I really appreciated all of the helpful comments. Esp the ice water for colder temps. I did find that upping the butter to 8 tablespoons (one stick) seemed to help bring out the butter flavor more. Also humidity plays a huge part in the water needed. The first batch was with the heat on in the house and super dry. It took all of the 2/3 cup of water. Day 2 was pouring rain and high humidity and only needed 1/2 cup of water. A few other things that, at least for me, worked out well. I used the pasta roller and actually folded and rolled again each time I moved to a thinner roll. It seemed to add a few layers to get flakier and wasn’t tough from being over worked. These have been a hit in our Christmas bags with fresh hickory smoked salt and apple smoked cheese. What is the shelf life on these crackers? Have you tried freezing the crackers or the dough? I needed to try a homemade version of the Ritz crackers to top my broccoli cheese casserole for Thanksgiving. Yours sounded easy and good! I used a good old fashioned pastry blender, not food processor though. Did half recipe and got 36 crackers. Once I removed from oven and topped with melted butter, I tried one. Thought the middle was a bit doughy, so I popped them back in the oven to “dry” as the oven cooled down. Maybe I’m just impatient to wait for them to cool and dry, but the taste sure was yummy! Oven times vary so maybe you just needed a little bit longer in yours. Glad you enjoyed. So many popup ads that it was difficult to see actual recipe. Hi, how would you get the crackers more yellow/orange looking like the real Ritz crackers?